Our removal guide gives details on the aZaZeL ransomware which is a computer virus that encrypts user and system data, the engine renames them with the .Encrypted extension. How Does aZaZeL Ransomware Infiltrate the System? aZaZeL Ransomware infections can be acquired by falling victim to one of the spread strategies used by its developers. Email spam messages are a primary carrier of the malware. The virus can be bundled in social engineering campaigns where it is delivered as a file attachment or linked in the contents. Hackers can host download sites and P2P trackers where virus instances can be found. In addition all types of web redirects, ad networks and etc can spread the infections. This includes browser hijackers, add-ons that invade the privacy of the infected browsers and redirect the victim machines to hacker-controlled sites. Security researchers uncovered samples associated with a new computer virus called aZaZeL ransomware. Its name suggests its basic goals – to infect as many machines as possible and process sensitive system and user data using a strong cipher. Threats like this one seek to blackmail with a specially made ransomware note. The security analysis reveals that the aZaZeL ransomware is made by an unknown hacker or criminal collective and does not contain code from any of the famous malware companies. When the infection has been made the virus automatically starts the encryption engine. It seeks to process data ascribed in a built-in list of target file type extensions. In most cases the malware seek to process the most commonly used files: videos, photos, music, documents, backups, configuration files and etc. Once this is complete the .Encrypted extension is used to mark all affected data. strongest encryption & unique key, generated for this computer. keep your lock id very safe else you can never recover your files. It will be better if you note it somewhere outside your pc on the paper. Step 1: Goto (www.coinmama.com/register) and register your account there using your email id. Step 2: After you register an account, you need to Signup/Login to your coinmama account. Step 3: Then Choose the amount of Bitcoin (0.1 BTC) you need to buy. Step 6: Deposit the given amount of money in Western union or Moneygram near your location to the given details. Step 7: After you deposit the cash, you will receive a transfer receipt with important information (eg:MTCN number). Step 8: Only then goto next step (i.e. Complete your order) to assure a successful transfer. Step 9: Copy the exact information as stated on your transfer receipt in the form. Step 10: Enter your Bitcoin wallet address properly in the form then update order. Your order will be processed once your transfer clears in their account. They will update you by email, moments after sending your Bitcoins. 2.Email id: Your email id in which you wish to receive the decryptor. 3.BTC address: Your bitcoin wallet address from which you have made the payment. decrypted back & you will loose them forever. 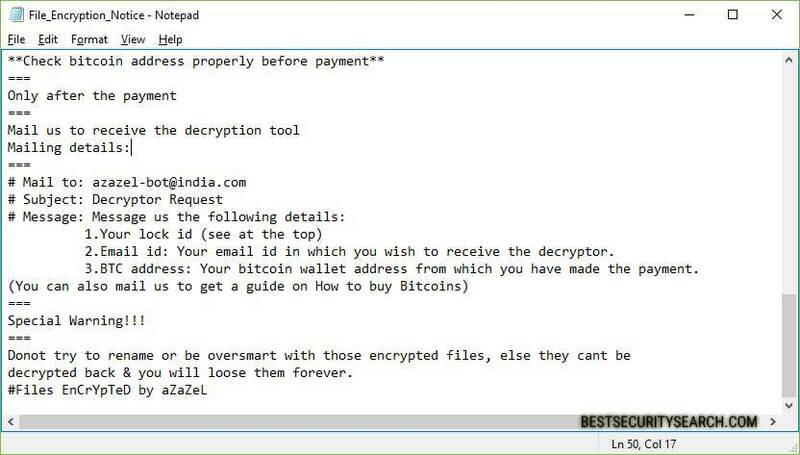 The criminal developers of the aZaZeL ransomware blackmail the victims into paying them a fee of 0.1 Bitcoin which is about 260 US Dollars. The Bitcoin address is provided and the victims are instructed on how to pay for the digital currency. A support email is created hosted on a free email hosting service. The victims of the aZaZeL virus are advised not to pay the fee or contact the hackers. Using a quality anti-spyware solution they can remove the virus, a data recovery program can restore the files. WARNING! Manual removal of aZaZeL Ransomware requires being familiar with system files and registries. Removing important data accidentally can lead to permanent system damage. If you don’t feel comfortable with manual instructions, download a powerful anti-malware tool that will scan your system for malware and clean it safely for you. WARNING! All files and objects associated with aZaZeL Ransomware should be removed from the infected PC before any data recovery attempts. Otherwise the virus may encrypt restored files. Furthermore, a backup of all encrypted files stored on external media is highly recommendable.